Tuesday Teaser 011209: Find the Shrike! 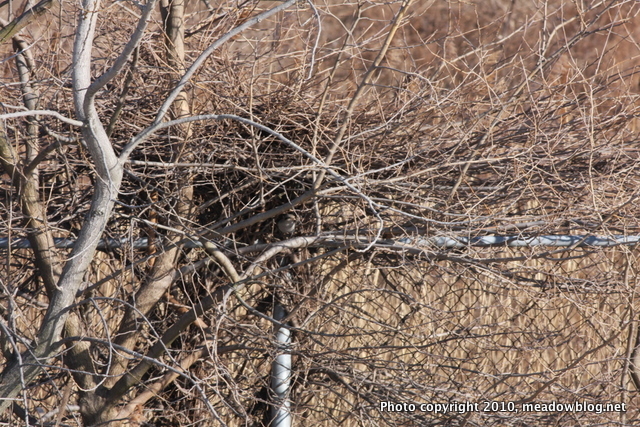 The Northern Shrike can be seen anywhere within a half-mile of the Retention Pond on Disposal Road, but we see the little dude tucked away along the barbed-wire Cyclone fence around the pond. He can easily hang out in there and go unnoticed. Click "Continue reading…" immediately below to see the bird's little hideaway, plus two other likely spots.